Since September last year I’ve been participating in New Zealand’s Imagine Cup competition. The competition is run annually by Microsoft and aims to let students develop software to help solve world problems such as poverty, pollution and pretty much anything (as well as making Microsoft look good). In the beginning it was just Joel and I. I had been interested in Imagine Cup for a few years but I’d never thought I had the actual skill level to participate. But Joel informed me that anyone could enter as long as they had a good idea and that later, teams could add more experienced coders. Coming up with the idea wasn’t difficult as I had previously thought of one a while back in a quick and dirty Imagine Cup Facebook competition. It won me an Xbox 360 Arcade bundle but they said the winner was drawn randomly. Maybe, just maybe it was a sign that my idea would take us somewhere! Unfortunately I can’t dissolve too much of our idea yet because even though we got kicked out of the competition (more on that later) we’re still working to bring it to life. I’ll give you one hint though, it’s a website focusing on Fairtrade. So Joel and I worked on the proposal together. Using Google documents a fair bit to keep it updated and meeting a few times in the Vic Uni library. We called ourselves Team Bean. It was a really creative phase, I had so many ideas for the website. It was really a pitch to get the judges interested. We sent it off and waited for a while not knowing whether we made it or not. Then we received word that we had made it into the top 50! Our next task was to prepare for a phone interview for the next round. And again we were met with success. Out of over 100 entries we had made it into the top 20, which was quite a surprise for both of us! 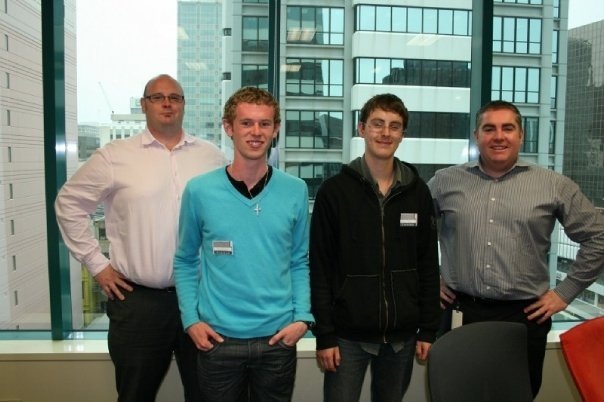 This was our first trip (of many) to the Microsoft floor inside the Vodafone building on Lambton Quay. We met up with our two mentors, Jason from Microsoft and Brendon from Provoke. We realised we needed coders and stat. Joel was a web designer by trade but we desperately needed some web coders to make the nitty gritty of it work using Microsoft technologies. We started a Wellington-wide manhunt. We kept hoping the Imagine Cup hosts would find somebody of us but they never did. Quite a few weeks later Joel got into contact with Adrian through a friend. Adrian also had a buddy at his work who was interested in joining us, Jeff. Together, Adrian and Jeff worked on the inner workings on the website. Because of the delay in finding new members, we had to basically cut one of my ideas which I loved dearly and thought was going to be a big part of the site. It wasn’t easy I tell you that! I had to push aside my dozens of sketches and ideas floating around my head. In the long run it made it easier to focus on the important stuff but I would still like to return to it at some point in the future. We had just got everyone organised in mid-January. Our presentation was scheduled for late February and we still had a lot of work ahead of us. Joel became our presenter (which I am extremely grateful for!). We worked on the PowerPoint together, researching Fairtrade – I got into contact with Julia from Fairtrade New Zealand who was only too keen to help us out. We also wrote about the problem, the solution, practicality and impact. So the big day neared. And I felt more and more nervous as our time approached. The team before us had technical difficulties and were running late. Our parking meter was about to expire but there was nothing we could do! We waited for what seemed to be an eternity in the conference room, watching the projected image of a room on the other side of the country (Auckland), waiting for the judges to enter. And so it began, Joel spoke. All that we worked for in the last few months came down to this. He spoke very well considering his audience was on the other side of a webcam. The questions at the end the judges threw at us weren’t there to make us feel at ease, questioning the business feasibility, stats and figures that I had no clue about. I am far from being a statistician! Joel handled these well but the judges still didn’t seem impressed with our answers. So that night we waited for the results. We encountered a bit of trouble with Live Meeting yet again – Microsoft’s conference software that allows application and desktop sharing, which the Imagine Cup folks shoved down our collective throats. We eventually found out the winning teams, a top four that excluded Team Bean. I was somewhat devastated. Because you see I was so invested in our idea, I honestly didn’t see it coming, that we might not make it through. Now the winners had all really good ideas (3/4 teams were from Auckland mind you, presenting live) and I applaud them for their efforts. But at the time all I could feel was pain, seeing one’s own baby kicked in the gut and tossed aside. As with Bike To Parachute which practically ran alongside this whole thing (talk about busy much!) I had a great experience, learning all kinds of new things and working on a collaborative team project. It felt so great being on top and recognised but I guess that wasn’t meant to last. I guess this is how American Idol contestants feel! Mind you we’re not letting Imagine Cup be the be-all end-all. In the next few weeks our plan is to talk to businesses to see if they’re interested in working with us. Team Bean may be dead but our idea will live on.